Since it’s almost the end of cherry season, I might as well post this up for who might wanna finish up the last bit of cherries. 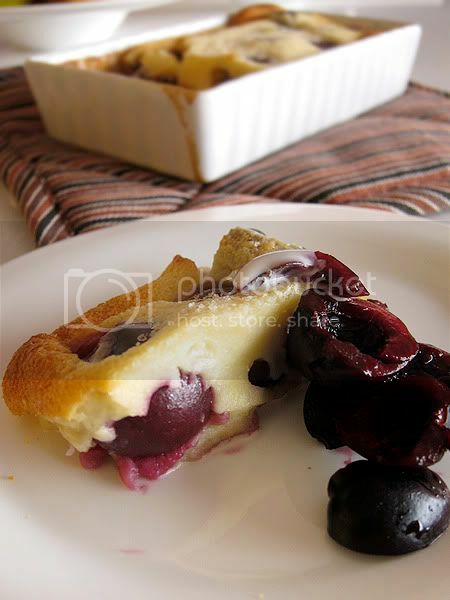 Cherry Clafoutis (Pronounced “klah-foo-tee”) is a simple French dessert, somewhat a cross of pancake, pudding and flan like texture and baked in a hot oven until the batter has set with a nicely browned and slightly puffed edges. 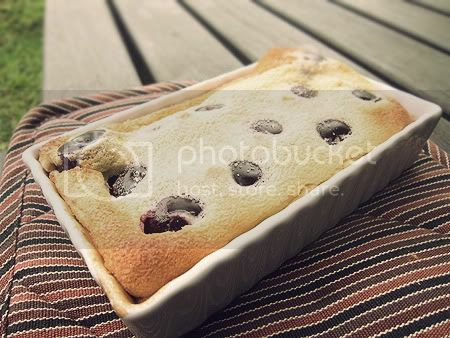 The steps are easy and this clafoutis smells AMAZING !!! I don’t know why but it’s this cake that made whole showroom smell darn amazing. Sweet vanilla caramelized flavour lingering around the office. Yes I do sometimes bring some food to the office and reheat it. This dish is traditionally made with unpitted cherries, so the seeds release an almond aroma. But of course, you can also make it with pitted cherries. I made mine with the kernel still intact. Well it DOES have a light almond flavour on the cherry. But seeing i’ve baked the cherry pie with pitted cherries, I would definitely like it better with pitted cherries, as I’m really not a huge fan of almond flavoured things. A few fresh cherries, pitted or unpitted. 2. Heat milk, cream into a small saucepan and bring to boil on the lowest heat. Put in sugar to melt. Set it aside to cool down. 3. Meanwhile, beat the egg and vanilla extract in a bowl. Pour the cream mixture into the egg. Whisk to combine. 4. Put in flour and whisk to combine. 6. 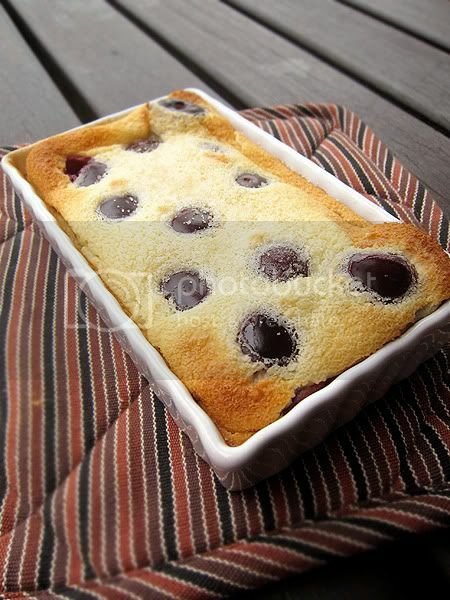 Put in pitted cherries and bake for 30 minutes until surface of the clafoutis is golden. Serve warm. Awww… a recipe from my blog. Eh, yours not too puffy leh, what’s the secret??? Oooh…that looks very delicious….mmmm. Love that creamy texture and the cherries to go with it. Would have to try. Thanks very much for sharing. I saw this from Wendy’s blog too, looks yummy!